Touted in the United States as the Film Hollywood doesn't want you to see, Green Street Hooligans crept into six theaters on September 9th and posted a weekend of gross of $48,000, that is about $7,000 per site, which Hollywood would not have believed, considering the top grosser of the previous week (on 3,000 screens), eked out a per site gross of $6,000. So, why is this new Elijah Wood film being released by its makers and promoted by Wood's fans. Maybe because the Hollywood machine has misunderstood the film, thinking it's a violent gang picture about the underground of a British sport starring a cute furry Hobbit. My, my-have they seen it? Have they bothered to attend a Film Festival where it garnered rave reviews and awards? Well, the cats out of the bag and this riveting, taut, well-performed film has made a mighty entrance, blasting to hell the finite obscurity of Hollywood moguls. Simply premised, a Harvard drop-out (expelled) visits his sister in London has a chance encounter with an in-law who takes him under his wing and introduces him to organized British hooliganism, the Firms-in this case the Green Street Elite, wrapped around the fanaticism of Football (that sport we call in the states Society Football; or SOCCER). But the film is not about Football or the violence attached to the Firms. It's deeply entrenched in primal man-the tribal man of the village. Margaret Mead would be quite at home (rest her soul) observing the rival firms standing and riling each other, much like Neanderthals at a Mammoth hunt. The script wanders a bit on a thin plot, but allows the message to be clear. When you share a central bond with villagers and stand your ground, you have invested your soul in the collective reputation of the tribe. Outsiders, who lack this, are mere wimps. 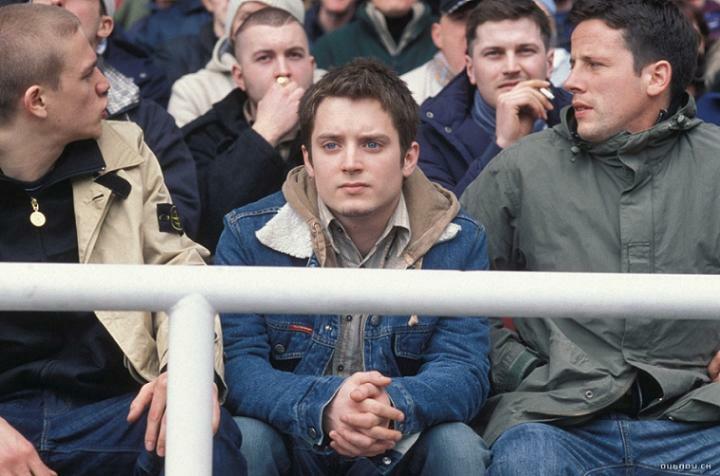 Elijah Wood as the Yank, Matt Buckner is superb as he grows a pair of balls over the length of the film. If you don't mind seeing everyone's favorite Hobbit have the stuffing beat out of him, and scrapping like the Dickens and enjoying the violence incrementally, you'll be okay. The acting job is sterling and filled with the steel that overtakes the character. His mentor, Pete, played by Charlie Hunnam, rushes like a river through the work, giving it buoyancy. Hunnam's cockney cleverness and leadership keeps the film alive and crisp, never a boring moment. In fact, the violence, which is not gratuitous, but organic to the work, draws you in to take a good look. This is the real stuff and we want to see Elijah Wood slam and get slammed, and Charlie Hunnam lead the tribe to victory. Of course, there are villains and naturally, a moral twist as the simple plot and theme gets aced by human failures, which drains all the nobility from the initial premise. Excellent performances are delivered by Leo Gregory who plays Bovver, the fly in the Firm's ointment; and Geoff Bell and Terrence Jay, the bad guys, each on opposite sides of the pond draw our our natural tendency to hiss on cue. Claire Forlani as Matt's sister delivers a credible performance, trying to match Elijah Wood with Buckner family nuances. Lexi Alexander, in her first directorial credit, does a splendid job handling angle and shot, many of which are iconic and deliver memorable punches, much like Elijah's Wood facial essays, which dot this film more than his others.